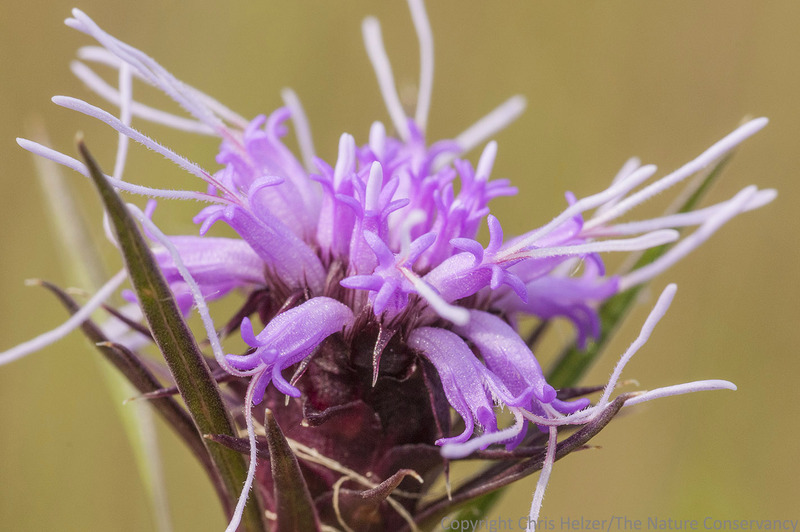 Scaly blazingstar (Liatris squarrosa). The Nature Conservancy’s Platte River Prairies, Nebraska. I was photographing some blazingstar flowers earlier this week when I saw one with a grasshopper sitting on it. It sat still long enough for me to get a few photos of it. A grasshopper standing innocently(?) on top of scaly blazingstar. Only when I looked the above photo on my computer screen did I notice the absence of most of the long white anthers I’d seen on other flowers. Surely, I thought, it’s not a coincidence that the grasshopper is present but the anthers are not…? The grasshopper eating one of the long anthers. Just because they are called “grass”hoppers doesn’t mean that’s all they eat. 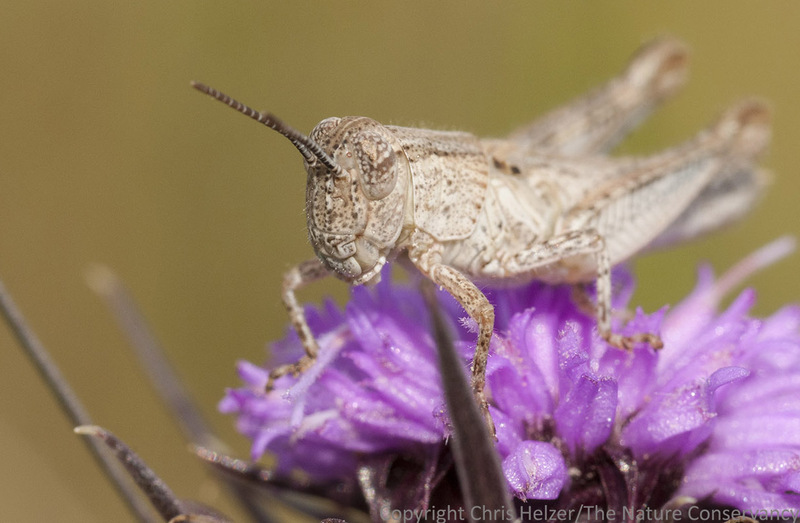 In fact, many grasshoppers eat pollen and other parts of wildflowers. Some are fairly specialized, while others are generalists in terms of the plant species they feed on. 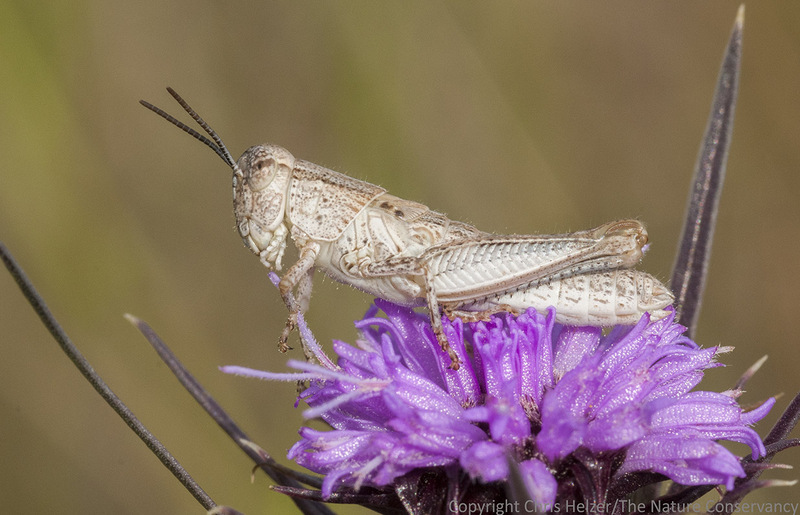 Even among the grass-feeding grasshoppers, there is great variety in which grass species and which parts of those grasses each species eats. For the sake of the scaly blazing star (and our seed harvest efforts this year), I hope at least some of the anthers survive uneaten so the plants can make seed. As more flowers open, maybe their abundance will be more than the grasshoppers can keep up with. At least in past years, we’ve usually gotten pretty good seed harvests from blazingstar, so I’m not too worried.